Rakusan did not include the Fan Series in his main sequence numbering. Therefore, the original number used for each of the 36 Series prints has been modified to identify the Fan Series members of its theme. The five different fan silhouette shapes have been here assigned arbitrary numbers 1 through 5. To indicate a fan design these shape designations are added to the 36 Series number separated by a hyphen. 110-5 is the Fan Series design with fan shape 5 in the 110 Persimmon theme. Like all other designs in this series, 110-5 was only produced in a single print run, and few copies are currently documented. The signature and seal markings and inconsistencies in style suggest that the 110 Persimmon designs were actually created over an extended period encompassing late 1933 into the middle of 1934. This theme is unusual in that it includes designs with four different seals which were produced in at least three distinct carving periods. 110-5 is one of two fan designs in this theme with later seal B (which also appears in the 36 Series design 110). Fan designs with seal B were typically used to infill quintets whose other designs had been carved in previous seal use periods. The relatively early distribution of the 110 Persimmon theme fan designs means that 110-5 (and the other seal B designs in this theme) would have been completed only shortly before publication. The composition of 110-5 is an unusual hybrid of two very distinct styles. 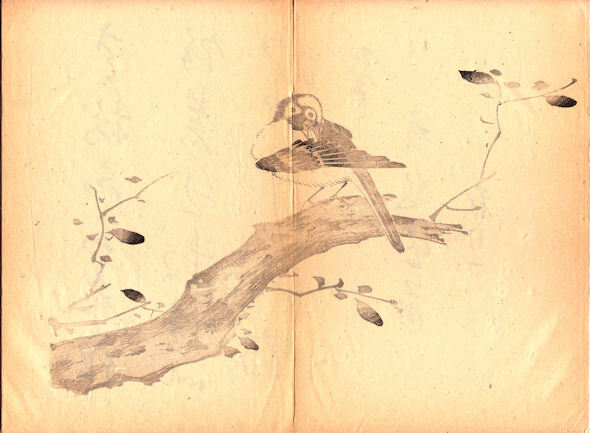 The relatively crude larger branch with a sparrow preening itself is superimposed by a persimmon branch executed in perfect negative imagery. 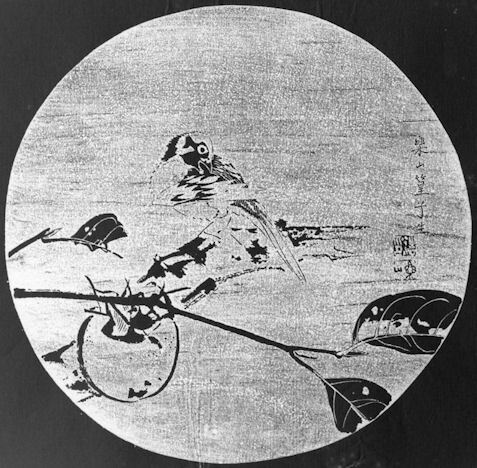 In fact the motif of the sparrow and larger branch is borrowed exactly from the work of another artist. In order to have the source design fit the 110 Persimmon theme, Rakusan omitted the original leaves and smaller branches and added his own separate persimmon branch. 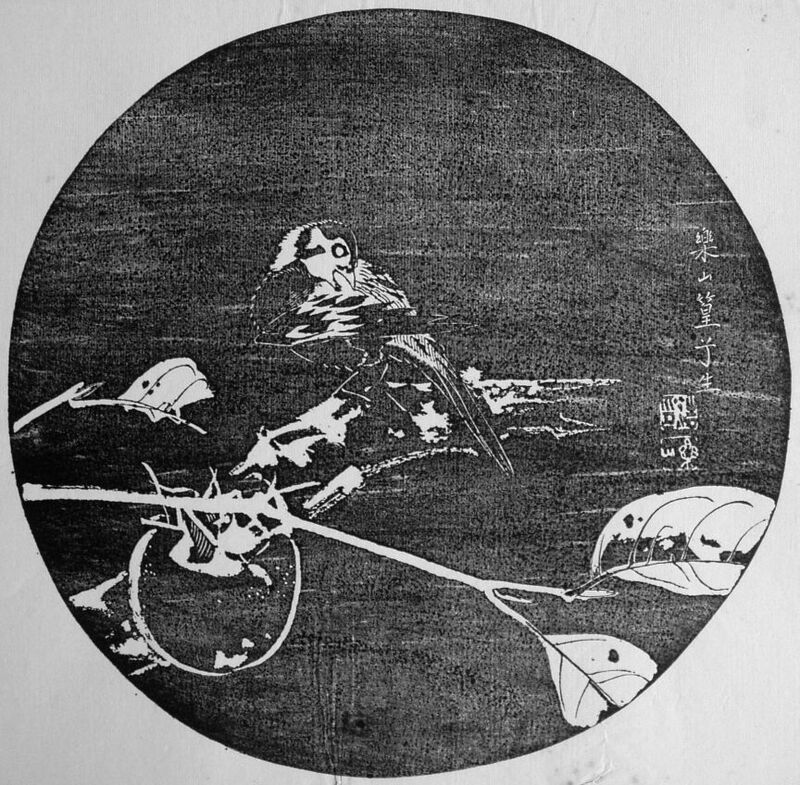 Rakusan completed each of the three themes in installment four with a single design taken from an outside source, Ten Bamboo Studio Manual of Painting, 十竹斎書画譜, Jitchikusai Shogafu. Here abbreviated TBS, this very famous, historic, and influential design book was first printed in China in the 17th century. TBS has been reproduced and reprinted in both China and Japan many times since, and Rakusan would likely have used one of the later Japanese translations.